That fantastic little “Bon Femme” cookbook was calling once again a simple French cookbook filled with fantastic classic everyday recipes and as I turned the pages I was tempted by so many, but since I had taken a small chicken out I settled on the osso buco style adapting it slightly. 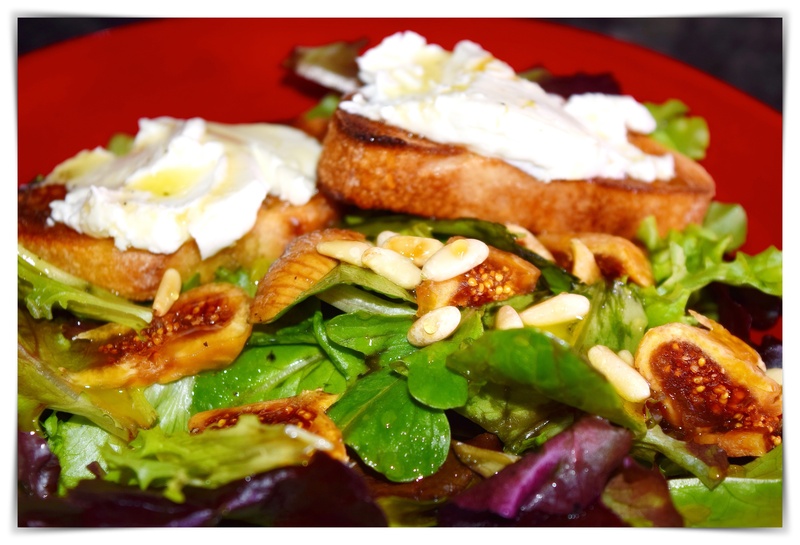 The simply dressed salad with dried figs, roasted pine nuts, toasted crostini with warm goat cheese and a drizzle of honey was a nice for a change as was the simple “Any Day Baked Rice”…what a great and relatively easy dinner. I have so many marked favorites to look forward to and great fun to have a complete menu from one book. I still prefer the real Osso buco, but until I find shanks again the basic flavors are here in the chicken version and I suppose that the little veal stock even made it better. No major changes which included a whole cut up chicken, a few more carrots whole garlic gloves and whole cipollini onions. Instead of cooking it stove top, I covered it, finished it in the oven for an hour or so and stirred in the gremolata before serving. 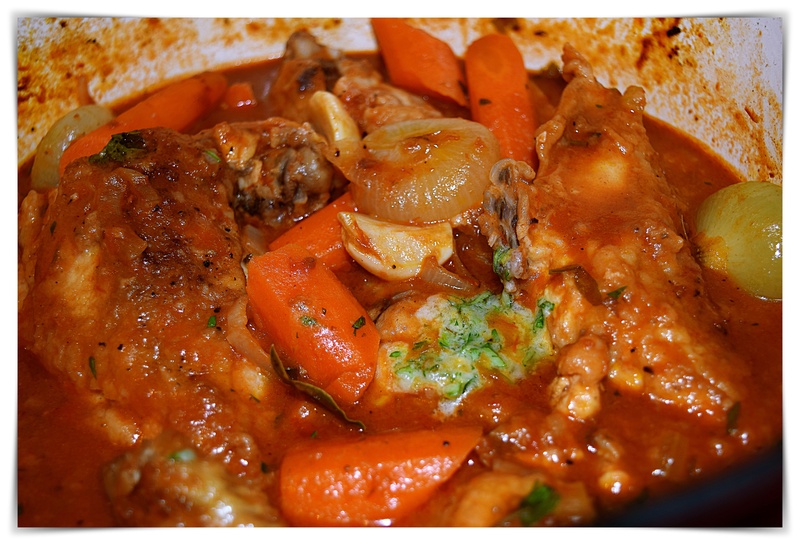 Osso Bucco-Style Chicken-slightly adapted original recipe link below. 1. Season chicken with salt and pepper. Dredge the chicken in the flour, patting off the excess. Heat the olive oil in a large Dutch oven over medium-high heat until it shimmers; add the chicken and cook, turning occasionally, until brown on all sides, 10 to 15 minutes (reduce the heat to medium if the chicken browns too quickly). Transfer the chicken to a plate and drain off all but 1 tablespoon of fat from the pan. 2. Reduce the heat to medium. Add the onion and carrots to the pan; cook and stir until the onion is tender, about 4 minutes; add the garlic cloves, carrots and onions and cook, stirring, until fragrant, 30 seconds more. Add the wine and chicken broth to the pan, stirring to loosen any browned bits from the bottom of the pan. Add the tomatoes and the bay leaf. Return the chicken to the pan, skin side up. 3. Tuck crumpled parchment paper over the “stew”cover and braise in the oven for at least an hour, test to see if the carrots and onions are tender. It might take a bit longer. 5. Arrange the chicken on a serving platter and spoon the vegetables and sauce over. Sprinkle with the gremolata and serve. Wini Moranville–author of The Bonne Femme Cookbook: Simple, Splendid Food That French Women Cook Every Day. I love your book and I have a list of things to cook from it. Have a great day!